massSMS automatically generates an Email with your contacts as a CSV attachment that you can send to your computer for further processing. The first row should contain the field names. You can use any field name as you want, as long as the first column still contains the last name, the second column the first name, and so on. Otherwise the results are unpredictable. 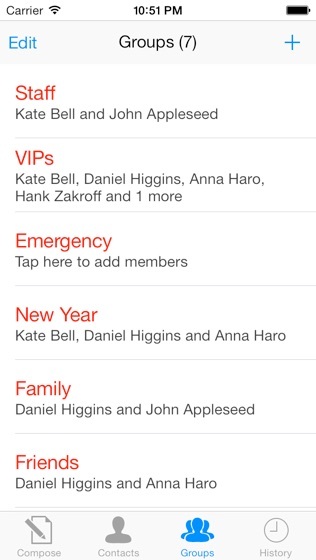 Enter one or more telephone numbers in the mobiles column, separated by spaces. Remember that you can assign a contact to several groups at a time just by separating the index numbers by spaces. if you don’t want to assign the contact to any group, then enter 0. 2)Save or export the file as CSV from within your spreadsheet software. 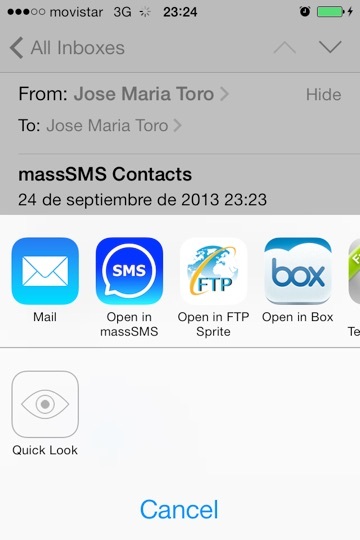 3)Send the file as an attachment to your iOS device via Email. 4)Open Mail in your iOS device. 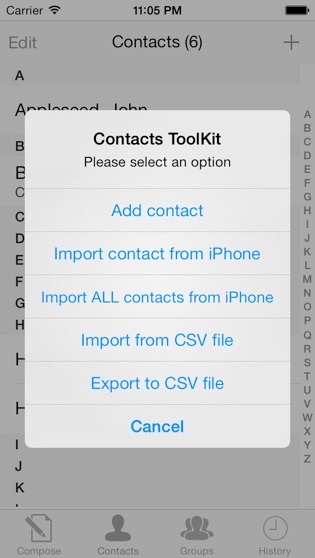 TIP: Your .csv file won´t import to massSMS? Click here to download a test file so you can have your own file match the correct format.